The major city-transport carrier in Prague is Dopravni podnik hl. m. Prahy, a.s. (The Capital City of Prague Transport Company). Its total annual transportation volume is more than one billion passengers. They are served by the system of underground, trams and buses. Where to ask for information? * Metro B-line, in the Mustek station underpass, under the Jungmannovo nam. Open Mondays to Fridays 7 a.m. – 9 p.m. , Sat: 9.30 a.m. – 5 p.m.
Open Mondays to Fridays 7 a.m. – 6 p.m.
C red colour (Letnany – Haje station), with possible changes at Muzeum station (lines A and C), Mustek station (lines A and B), Florenc station (lines B and C). Metro operates daily from 5 a.m. to 12 p.m. The time interval between train departures is approximately 2 – 3 minutes during the workday rush hours and 4 – 10 minutes during off-peak hours. Daytime operation is from 4:30 a.m. to midnight. Night operation is from midnight to 4:30 a.m. and is provided by tram numbers 51 to 59 in the interval of 30 minutes. The central interchage station for night lines is Lazarska stop. Tram schedules are located at individual stops. sightseeing rides on this historic tram through the downtown area; runs from April to November. The daytime and night operation of buses is similar to tram operation. Night service is provided by bus numbers 501 to 514 and 601 to 604. Bus schedules are located at individual stops. The Funicular to Petrin Hill operates along the route Újezd – Nebozizek – Petrin. The Funicular operates daily from 9:00 a.m. to 11:30 p.m. (April – September) and from 9 a.m. to 11:20 p.m. (October – March) with traffic intervals from 10 to 15 minutes. Travelling by city transport is possible only with a valid ticket. Passengers have to obtain their tickets before boarding the vehicle or entering the Metro system. The ticket is valid only if marked in the validation appliance. Tickets can be bought at selected Metro stations or in Dopravni podnik Information Centers, hotels, at news stands, travel bureau, department stores, etc. Single tickets can also be bought from the ticket vendors located at Metro stations or near some stops of surface transport. N.B. 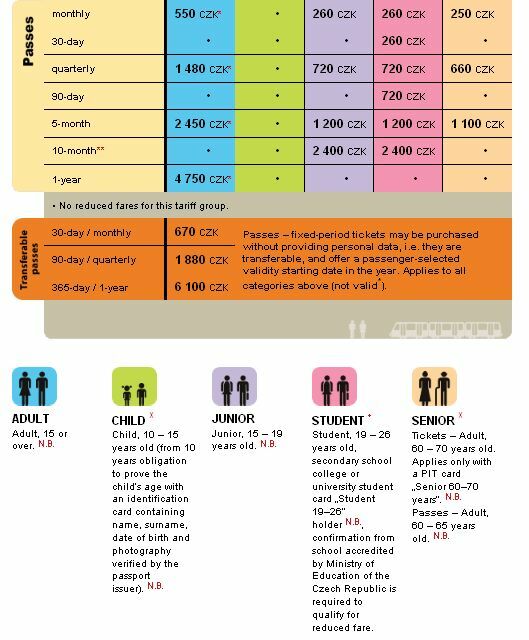 The following applies: commencing on the day of turning the required age and ending on the day preceding the day in which the age limit is reached. X For children from 6 to 15 years of age N.B. and seniors from 65 to 70 years of age N.B. that have an opencard with a „Special fare endorsement“ (endorsement price is 120 CZK), the fare for travel in Prague (tariff zones P, 0 and B) is 0 CZK. Children from 6 to 10 years of age N.B. require only an identification card certified by its issuer (a corporate entity) with name, surname, date of birth and a photograph. 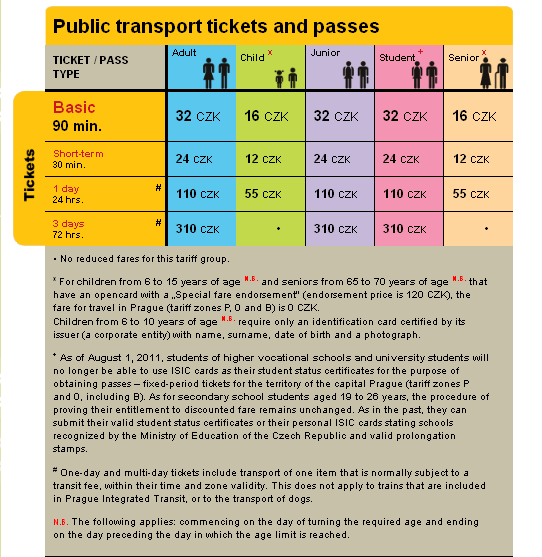 – As of August 1, 2011, students of higher vocational schools and university students will no longer be able to use ISIC cards as their student status certificates for the purpose of obtaining passes – fixed-period tickets for the territory of the capital Prague (tariff zones P and 0, including B). As for secondary school students aged 19 to 26 years, the procedure of proving their entitlement to discounted fare remains unchanged. As in the past, they can submit their valid student status certificates or their personal ISIC cards stating schools recognized by the Ministry of Education of the Czech Republic and valid prolongation stamps. * An adult passenger who is a holder of a valid pre-paid time ticket may be accompanied by 1 child up to the age of 15 (from 10 years obligation to prove the child‘s age) on Saturdays, Sundays and public holidays free of charge (excl. PIT trains). N.B. ** With limited optional validity beginning in time period between August 15th and November 1st. The validity of tickets can be checked by the ticket inspectors of Dopravni podnik at any time during travel or stay in the Metro system. The ticket inspector is entitled to ask the passenger to produce his or her valid ticket, to confiscate invalid tickets, and to collect a penalty (950 Kc, if paid at once 700 Kc) in case of travel without a valid ticket. In case of unpaid freight the inspector collects a penalty 200 Kc, which is reduced to 100 Kc, if it is paid on the spot or in an excess fare ticket office of Dopravni podnik. To prove their identity, inspectors produce yellow-and-red badges. They issue receipts for the penalty amounts. Special bus lines № 1 and № 3 providing transport of disabled persons in wheelchairs connect the suburbs Cerny Most II, Jizní Mesto II, Repy, Sídliste Dáblice with the centre of Prague (Metro station Florenc) where the change of lines is possible. These lines are in service during the working days only. The line № 291 connects the health facilities in the area of I. P. Pavlova Square – Charles Square – I. P. Pavlova Square. Detailed information: Dopravni podnik hlavniho mesta Prahy (The Prague Public Transport Company, a.s.).